A company called CyberHound was blocking our email because it claimed the message included a “spam URL”. So I decided to reach out via their Contact Us form. 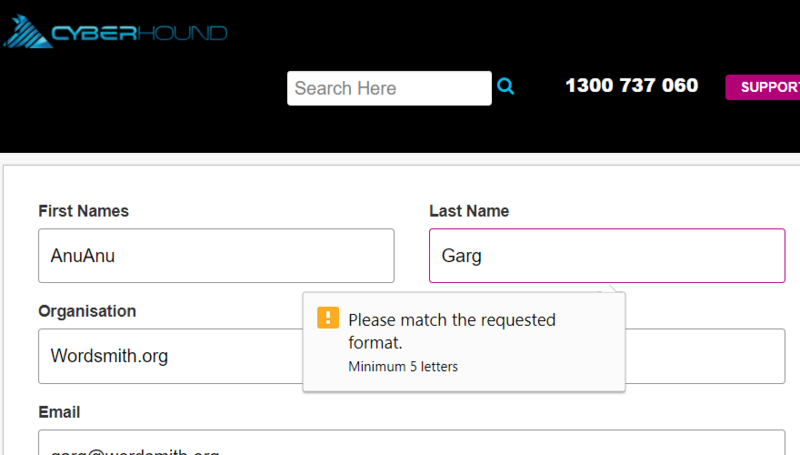 After I filled it out and pressed the submit button, the form complained that I needed to enter a minimum of five letters for my first name. At this point I gave up. Well, Procrustes is alive and well. I figured even if my message reaches them, they might write back to confirm that my height is a minimum of five feet, my hands have a minimum of five digits each, and I chew a minimum of five times. Unlike some corporations out there, we don’t discriminate against short names. Or short words. In fact, we’ll take this week to highlight them. PS: Their CEO is named John and the Head of Products is Adam. For verb: From Old English ecan (increase). Ultimately from the Indo-European root aug- (increase), which also gave us auction, author, auctorial authorize, inaugurate, augment, august, auxiliary, nickname (“a nickname” is a splitting of the earlier “an ekename”, literally, an additional name), and wax (the verb). Earliest documented use: 888. For adverb: From Old English éac. Earliest documented use: 700. Maureen Child; Have Baby, Need Billionaire; Silhouette; 2011. See more usage examples of eke in Vocabulary.com’s dictionary.